The ongoing international global warming conference in Copenhagen has witnessed more intrigues, plots, sabotages, climaxes and anti-climaxes than in the Mahabharat. Global warming is today a matter of life and death. As leaders of 200 countries meet and talk in Copenhagen and promise to meet again to talk, the threat of global warming swells. Deadlines to amend the way people live on this planet have passed. But the deception and manoeuvring being witnessed in Copenhagen indicate that unless people spare a serious thought towards a terminally ill planet, 'government to government' talks will not make the earth green again. Notwithstanding the expected political or any other resolution at Copenhagen, rediff.com is kick-starting a series to show how some Indians are showing concern for the environment, how at the individual level they are gearing up to make a difference in retaining the green values. There are scores of Indians, Indian institutes and Indian ideas that are contributing to better our ecology, our air, our water and our land. 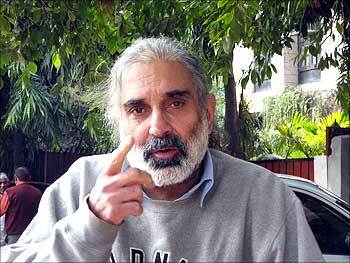 Rahul Bedi, a distinguished journalist known for his writing on India's military and strategic affairs, is one of them. He made his mark by contributing insightful reports for Jane's Defence Weekly. Today, he also writes for the UK-based Daily Telegraph and Dublin-based Irish Times. A resident of New Delhi's Neeti Baug colony, Khelgaon Marg, the road in front of his house, is never silent. Buses, trucks, cars, three-wheelers and two-wheelers buzz past throughout the day. However, these days, no matter how busy his schedule, Rahul rarely uses his sports utility vehicle in which he has travelled the length and breadth of the city. Instead, he cycles to work; even if he is out to meet dignitaries like the Navy chief Admiral Nirmal Verma. He doesn't regret switching over to a bicycle. It keeps him fit and, according to him, has helped reveal a wonderful new world around him. Automobile emission is the key factor behind the rising air pollution levels because it comprises a large amount of toxic gases, including carbon monoxide, hydrocarbons and oxides of nitrogen. Combustion engines emit most of the greenhouse gases that accumulate in the atmosphere, further puncturing the Ozone layer that protects the earth. These days, Rahul's diesel-guzzler, which emits more CO2 than a petrol-run car, is parked along the sidewalk. Rahul pedals nearly 45 kilometres a day. In fact, the cycle has become an inseparable part of his life. The affable journalist-turned-cyclist has a story to tell. Sheela Bhatt listens in. I have lived in New Delhi for 25 years. I have spent my university years in Delhi in the late sixties. I am quite aware and anguished to see the changes in Delhi's air and water. Then, Delhi was much nicer, gentler, less crowded and not much polluted. Monsoon used to take place on time and would last some 3-4 months and winter used to be very cold and very chilly unlike now. Winter used to set in on Diwali and would last till Holi. So it was almost a stretch of five to six months when we would enjoy various shades of winter -- chill, cold and gentler weather during those months. Now, 35 years later, it is unbelievable to see what we have done to New Delhi. We have completely scarred it; we have crowded it. We have turned it into a slum. The traffic is all over the place. Power and water shortages are still there. And then there is road rage, which you can't avoid. All these are problems of urbanisation, which were not there during my college days. I have taken to cycling since the last three to four years. In the last two years, I drove my car almost 300 to 400 km a month, but I cycle about 900 km a month. Sometimes I cycle more than 1000 km a month. I cycle for work and also for pleasure. I surely cycle for 40 to 50 km for about five days a week. My first cycle clocked about 4000 km. That was stolen from my house. My new cycle has so far clocked 6000 km. I have lots of carbon credits to my credit! I wish some thousand people did what I am doing. It will make a minor difference but that's fine, no? If I have to travel short distances, say for instance to the market place that is about three km away from my home, I use my cycle. Actually, I took up cycling because I wanted to travel to my squash court every day, which is 1.5 km from my home. It was such a hassle, spending some 30 minutes navigating through traffic and parking. But on my cycle, it takes just 10 minutes. Now the idea of cycling has developed into a way of life. I have easy access to wherever I want to go. Sometimes I go to Khan market, which is 5.5 km from my house. My car will take 25 to 30 minutes to reach there. But on my cycle it takes just 16 minutes. Cycling is no more about romance; it is practical. Cycling is romantic in the West. I have just returned from Chicago, which has beautiful cycling tracks all over. The city is geared up for cycling. They have erected poles to lock and park the cycles. It is a very cycle-friendly society. 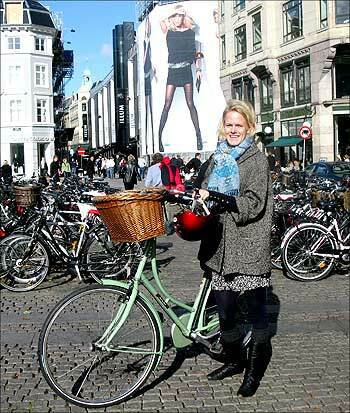 In fact, they encourage people to go on bicycle. 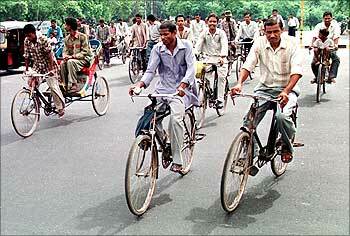 In India, the bicycle is looked down upon as it is considered the sawaari (ride) of the poor and the under-privileged. In India, no sahib (boss) or upwardly mobile person would think of using a bicycle. The excuse they use is that it is unsafe and the traffic is unruly. I don't fully agree with them. But in case of womenfolk I do think that safety is an issue at night-time. My own experience, however, has been different. I found that a lot of people respect me for cycling to work. Bus drivers wave at me. Truck drivers and auto-rickshaw drivers give me way. Surprisingly, even beggars near the Saibaba Mandir near Lodhi Road give me the thumbs up! I invariably cross that lane once a day. Only sethlog (affluent people) look upon cyclists with disdain. But the common man of India respects cycles. In summer, I agree, it is difficult to cycle. For pleasure, I drive in the mornings during hot days. During those times I cycle for my errands in the late evening hours. If someone invites you for dinner, it is a little awkward to reach there sweating. It's unsocial, but surely for eight months a year you can cycle comfortably. If I go to states around Delhi, I carry my cycle in the back of my car. I have not found more pollution on roads than I was facing in other modes of transport. My skin is also okay despite so much exposure. I think it is possible to cycle in urban India. But the major hurdle is that it is a social problem. I think, at the end of the day, people become lazy. They find it more convenient to be driven by a car or drive themselves. But, I still repeat that it is high time we realise the efficacy of cycling. It is something that saves carbon footprints. It saves time and lots of energy. In Copenhagen, governments may talk to each other. But, it is up to individuals; we should use less energy, less water and cut air pollution. We surely need individual enterprise in reducing carbon footprints. We must save water and electricity. We must not contaminate natural resources and for that we need public awareness without depending on the sarkar (government). Cycling is a hard part in this regard. I use a very ordinary cycle, costing Rs 2200. I was delighted to know that an architect friend of mine is designing the first cycle track in Nanded, Maharashtra. 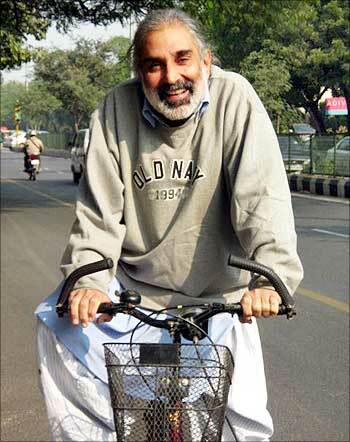 I know of a man named Pritam Singh, who took up cycling at age of 58. Today he is 78 years old, but still cycles 200 km daily. He travels from Hoshiarpur to Chandigarh or to Amritsar. He is much more healthy than he was at 58. He is a delightful old man who has travelled all around the world on a cycle. He is quite an inspiration for me. He gets up in the morning, does his exercise and he is gone. He just enjoys his cycling. I agree, when you are on roads in India safety is an issue. But, when I switched over to the bicycle, I carried the confidence that I had while driving the car. Traffic moves fast, but with every passing year it is slowing down. These days, in peak hours, you can only drive at 15 to 20 km an hour. Experts say it will come down to seven km an hour by 2010. I do an average of 21 km an hour on my cycle. I cover the ground far quicker during rush hours. The speed is not a problem. The Delhi police is not bothered about cyclists at all. They don't harass us. Sometime if you jump a red light or go the wrong side of the road in rush hours, the cops tend to overlook it. I don't recommend it, but generally most people are sympathetic to cyclists when they break rules. With less and less people cycling over the period of time in urban areas, the number of cycle shops has come down. Because of this, if you have a puncture, it has become difficult to find a repair shop around the corner. So cycling does become difficult sometimes. But these days, cycles are so good that they hardly need maintenance. My bicycle seller in Khan Market says his sales have increased. Foreigners, particularly diplomats -- most of who live in Chanakyapuri, which is relatively traffic free -- buy cycles when they come to India. Another aspect is that everyone gets excited when you talk about your cycling experiences. I tell them cycling is about fitness. It's a complete exercise. I have lost about 15 kilos since I started cycling. However, still nobody wants to cycle. They give the usual excuse. They say they don't have time and traffic worries them. I think it requires a certain amount of determination. Some of my friends say I am crazy. I have a brother who lives in Gurgaon, some 20 km away from my home. I visit him on cycle only. I find cycling very relaxing. I simply don't want the tension of driving. I get good sleep because I am totally into body exercises. I do my time management. Two hours a day is something one should afford for keeping fit and keeping the environment carbon free. I think cycling is something that we should all try out and emulate. It is safer and great fun. When you see things around, you become conscious of your environment. It makes you sensitive. When you are driving in a car you don't quite absorb the city. The cycle is a life partner; cycling is a philosophy. It's a way of life. If animals could talk, they'd say act now to save the planet!